Don't forget to call your Mother on May 12th, BUT send her something sweet today! Our Mother's Day Tea Party Basket is a great treat for the women in your life this Mother's Day. This delectable assortment of sweets is sure to please — favorites includes Savannah Toffee, assorted Chocolate Truffles, Our Signature Milk Chocolate Gophers, one White Chocolate Covered Pretzel, one Dark Chocolate Covered Pretzel, Glazed Pecans, Sea Salt Caramel Squares, Two White Chocolate Rose Suckers, and, of course, a Savannah favorite, Pralines. 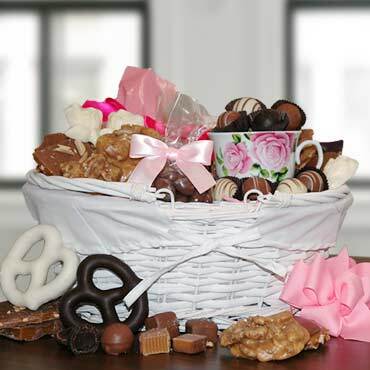 In addition to all of those mouthwatering treats, our basket also includes a floral teacup with matching saucer. Excellent basket, beautiful presentation! My Mom loved it and really liked the cup and saucer. The candy was delicious !! The look was so elegant, only topped by the quality of the delicious treats inside! A perfect gift I will continue to order time and time again.